Year 7s and 8s welcomed Oakfield to Hugh Sexey's on Wednesday 22nd November. 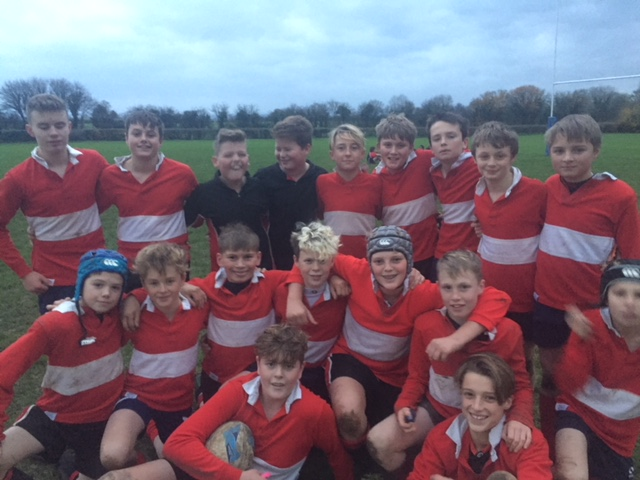 Hugh Sexey's Year 8 rugby team have been working very hard in training, and in their games lessons, on ball presentation as well as working extra hard on the floor to keep the ball safe. The boys were told to put what they had learnt into practice in the match. All the boys were fantastic - they were everywhere on the pitch and played superbly as a team. They were particularly outstanding in the rucks and the scrum. It was great to see good numbers of boys wanting to play for the school team, and enjoying their rugby with a smile. Hugh Sexey's won the game very comfortably in the correct spirit of sportsmanship, discipline, and enjoyment. Well done lads - an excellent performance, keep up the good work. Credit must also go to Oakfield for keeping going and not giving up.